Focusing on Community Stewardship, Education and Scientific Research. Member of The Coalition to Preserve Puget Sound Habitat. In association with: Protect our Shoreline, Henderson Bay Shoreline Association, APHETI, Mayo Cove Shoreline Association, Case Inlet Beach Association and Citizens of Harstine Island, Stretch Island, Anderson Island, Vashon Island and Jefferson County/Shine Beach. Canadian Partners: Association for Responsible Shellfish Farming. "The proposed action (existing shellfish aquaculture) is likely to adversely affect CH (critical habitat) for PS (Puget Sound) Chinook salmon and Hood Canal summer-run Chum salmon." "Salmon country has been plundered and hurt." "We must now take the time and interest to help the creator to repair the damage to the home of the salmon. If we take care of the salmon, the salmon will take care of us." Beautiful and pristine Case Inlet in South Puget Sound of Washington State is an arm of water between Key Peninsula on the east and Harstine Island on the west. It's north end, called North Bay, reaches nearly to Hood Canal, creating the defining isthmus of the Kitsap Peninsula. Case Inlet is the boundary between Pierce County and Mason County. The southern end of Case Inlet is connected to the Nisqually Reach, part of the southern basin of Puget Sound. The many coves, bays and estuaries of Case Inlet such as Rocky Bay, Vaughn Bay, North Bay and Dutcher Cove are all well known prime habitat to native salmon species such as Chinook, Coho, Chum, Steelhead and Sea Run Cutthroat, flatfish species such as Sole and Starry Flounder, and other important species such as Herring, Perch, and Rockfish. Stretch Island, Reach Island, the Eastern shore of Harstine Island and Herron Island also support nearshore habitat in Case Inlet. Numerous shorebird species include the American Bald Eagle and the elegant Great Blue Heron. Geoduck tubes before installation of wildlife predator exclusion nets. Besides the visual impact of millions of PVC tubes, commercial aquaculture threatens wildlife, water quality, beach erosion, silting of coves and estuaries, property values, recreational access and serenity. Industrial aquaculture involves the placement of barges and obstructions in Case Inlet for planting and harvest activities and equipment storage. Artificial lighting and diesel powered equipment is used. Industrial aquaculture and the noise associated with such activities can occur day and night. Case Inlet will be vastly altered by the planned scope of industrial aquaculture, which focuses on not only geoduck but also on other shellfish planting and harvesting. "Private tidelands are misrepresented as residential/recreational beaches. [Pierce] County must recognize that the primary purpose of privately held tidelands is shellfish farming and not residential recreation." *Peter Downey, Pacific Coast Shellfish Growers Association, Pierce County Council Meeting, January 15, 2007. *Mr. Downey bases his comments on the Bush/Callow Acts of 1895. Both Acts were repealed in 1935. Both the Shoreline Management Act of 1971 and the common law Public Trust Doctrine do not recognize shellfish farming as the primary purpose of privately held tidelands. The primary purpose of both public and private tidelands are for the public's use - including residential recreation. This powerful industry has clearly targeted Case Inlet as a desirable location for expansion of commercial operations because of the clean water and pristine beaches. They wish to garner acreage wherever possible and exploit it by planting geoduck 'seedlings', four to a PVC tube, with approximately 43,000 PVC tubes per acre. Other intensive aquaculture practices include clearing the beaches of rocks, shells, sand dollars, starfish, crab and any other species of nearshore wildlife that gets in the way. Large canopy nets are used as predator exclusion, further altering the habitat. Geoduck 'harvest' involves liquefying the sediment up to three feet down with powerful high volume water jets. They intend to convert tidelands to industrial aquaculture use, using rotational and perpetual cultivation cycles, thereby vastly and permanently altering the tidelands, species diversity, and habitat. Once the damage is done, it will be difficult or impossible to repair. Allowing expansion of industrial aquaculture with no understanding of its long term effects poses a grave danger for Case Inlet and all who enjoy Case Inlet's pristine waters and beaches. The shellfish aquaculture industry has not justified it's practices in relation to possible ecological impacts to forage fish, salmon, and nearshore habitat. Jonathan Davis, a shellfish biologist for Taylor Shellfish Farms has stated, at the recent Sea Grant Symposium, that the dynamics between shellfish aquaculture and forage fish and salmon habitat is not well known or understood and needs to be studied further. The shellfish industry and WSDNR should voluntarily agree to an immediate moratorium on expansion of geoduck aquaculture until research on the possible impacts to fish habitat have been completed. Native wild Puget Sound salmon populations are down 92% from historic levels. Shore bird populations are down 40% just in the last 20 years. Given the aggressive expansion of intensive industrial shellfish aquaculture spearheaded by Taylor Shellfish Farms, Seattle Shellfish and Chelsea Shellfish, coupled with the mismanagement and incompetence at the Washington State Department of Natural Resources, along with an indifference to objective scientific research by independent and qualified fisheries biologists, we will continue to see dwindling salmon runs and supported native wildlife in Case Inlet. 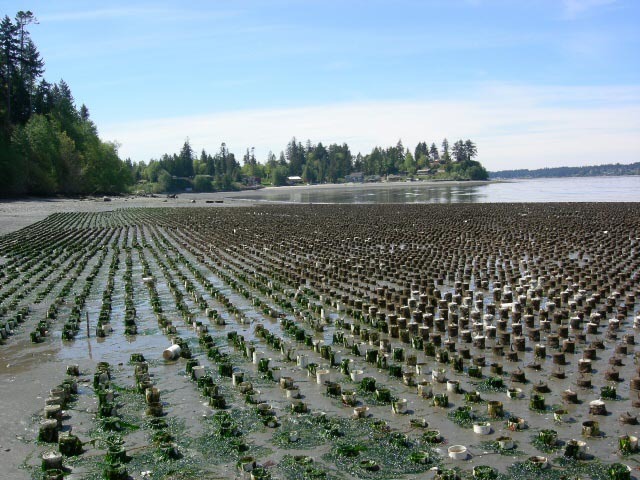 In 2000, Taylor Shellfish employees rake and remove aquatic vegetation in North Bay to make way for geoduck planting in violation of State guidelines. "Aquaculture should not be permitted in areas where it would result in a net loss of ecological functions, adversely impact eelgrass or macroalgae, or significantly conflict with navigation and other water-dependent uses." "Permitted uses in the shorelines of the state shall be designed and conducted in a manner to minimize, insofar as practical, any resultant damage to the ecology and environment of the shoreline area and any interference with the public's use of the water." "Sand dollar beds are uncommon and may be declining in Puget Sound, are a key ecological species controlling local communities, may serve as refuges for young Dungeness crabs, and do not return to beaches once lost." Megan N. Dethier, PhD, UW, Amy Leitman, MS, Bill Mathews, PhD. (Above) Sand Dollars stripped from their tidelands to make way for geoduck tubes; dumped and left to die by Seattle Shellfish, near Steamboat Island, March, 2010. "Visitors, however, can harm sand beaches by collecting Sand Dollars…just walking can damage organisms living at or near the sediment surface. Both activities can kill sand beach species and reduce the food available for the birds and fish who feed here." "A close up look at a bed of Sand Dollars in the South Sound. Typically where you find a good number of these, you will find a healthy beach for SRC’s (sea run Cutthroat)." "The SMA is intended to protect shoreline natural resources, including '...the land and its vegetation and wildlife, and the water of the state and their aquatic life...' against adverse effects." "The overarching policy is that 'the public's opportunity to enjoy the physical and aesthetic qualities of natural shorelines of the state shall be preserved to the greatest extenst feasible consistent with the overall best interest of the state and the people generally.' Alterations of the natural conditions of the shorelines of the state, in those limited instances when authorized, shall be given priority for...development that will provide an opportunity for substantial numbers of people to enjoy the shorelines of the state." "Eelgrass density was depressed in summer by space competition with geoducks." "When geoducks were harvested at the end of the experiment, eelgrass shoot density dropped by more than 70 percent." "The artificial propagation of native and non-native fish and shellfish species in or adjacent to salmon EFH has the potential to adversely affect that habitat by altering water quality, modifying physical habitat, and creating impediments to passage." " Various methods of shellfish culture and harvest also have the potential to adversely impact salmon EFH, such as dredging in eel grass beds, off-bottom culture, raft and line culture, and the use of chemicals to control burrowing organisms detrimental to oyster culture." Fresh geoduck planting, North Bay, 2000. Once an area of expansive eelgrass, none exists there today. "One of the greatest long-term threats to the viability of commercial and recreational fisheries is the continuing loss of marine, estuarine, and other aquatic habitats." "A National program...to insure conservation, to facilitate long-term protection of essential fish habitats." Numerous geoduck farm sites under private leases to Taylor Shellfish Farms and Seattle Shellfish have already been established on Harstine (Spencer Cove) and Stretch Island and many other areas of upper Case Inlet in Mason County. In East Case Inlet, Pierce County, a large (one mile of shoreline) Taylor Shellfish Farms intertidal geoduck site exists near Joemma State Park, known as the Foss Farm. Several leases have already been approved by Pierce County for Taylor Shellfish: near Vaughn and near Herron Island. Click on links below for permits. Above, Taylor Shellfish Farms' new PVC geoduck tube installation at Stratford/Meyer site, Pierce County, July 20, 2009. Above, Taylor Shellfish Farms new PVC geoduck farm at Stratford/Meyer site, Pierce County, July 20, 2009. Taylor provided nothing more than 'sketches' of a test plot to prove this was an existing commercial site to qualify for the NWP 48 permit. Residents will testify that there was no commercial operation here before March, 2007. Never-the-less, the Army Corp of Engineers accepted this as evidence. This farm was not registered with WDFW until July 30, 2009. Mason County continues to turn over sensitive nearshore habitat to the shellfish industry without a shoreline development permit process, without environmental impact statements, without independent or public review, without scientific assessments on impacts to salmon and fish habitat and impacts to sport fishermen and recreational boaters. The North Bay Taylor shellfish lessors include a 27 acre tidelands parcel owned by Reginald Engman. This parcel purportedly generates over $70,000. per year for Mr. Engman, not counting the percentage of harvest. In spite of this windfall, Mr. Engman pays just $135. per year in taxes on the parcel. "Cultivating shellfish in the South Sound results in the loss of shallow nearshore habitat and habitat diversity that is important to salmon." "The legislature further finds that much of the shorelines of the state and the uplands adjacent thereto are in private ownership; that unrestricted construction on the privately owned or publicly owned shorelines of the state is not in the best public interest." " This policy contemplates protecting against adverse effects to the public health, the land and its vegetation and wildlife, and the waters of the state and their aquatic life." "The legislature declares that the interest of all of the people shall be paramount in the management of shorelines of statewide significance". "(1) Recognize and protect the statewide interest over local interest; (2) Preserve the natural character of the shoreline; (3) Result in long term over short term benefit; (4) Protect the resources and ecology of the shoreline; (5) Increase public access to publicly owned areas of the shorelines; (6) Increase recreational opportunities for the public in the shoreline." "Habitat modification and the covering of the substrate with predator exclusion nets may thus adversely impact the production of harpacticoid copepods and other epibenthic organisms, and hence adversely impact the successful feeding of salmon rearing in the area." "It is generally acknowledged that the culture of bivalve molluscs may have a wide range of impacts on the habitat and community structure of coastal marine ecosystems." CSAS, Indicators and Thresholds for Use in Assessing Shellfish Aquaculture Impacts on Fish Habitat, 2006, page 2. "Our results suggest a net decrease in total shorebird use in areas developed for aquaculture." This Seattle Shellfish operation is about 33 acres consisting primarily of geoduck . Several parcels totalling 26.5 acres are registered to Toebbe's Clam Farm. If the geoduck densities here are similar to Taylor Shellfish's Foss site, the value of these 2 parcels could be in excess of $40 million. Yet the combined parcel taxes are less than $45. per year. Seattle Shellfish also has geoduck and shellfish aquaculture operations in Pierce County, just south of Joemma Beach State Park. This 40 acre tidelands parcel is owned by the YMCA (parcel number 0020164001). None of the required permits were obtained for this commercial operation. "Seeding of young geoducks in netted PVC tubes on the beach is likely to alter local physical and biological conditions, both those on the surface of the sediment and those in the sediment." Above, Seattle Shellfish, Harstine Island, Spenser Cove, kiddy pool geoduck incubators, loose PVC tubes, July 4, 2008.
review by Mason County through the Shoreline Master Program if they are to be used. that will far exceed the immediate benefits." "Nearly every just cause is a struggle between the good of the many and the greed of a few." Carl Safina, VP for Marine Conservation at the National Audubon Society and founder of Audubon's "Living Oceans" program. "Shellfish aquaculture in South Sound alters plant and animal assemblages and results in the loss of shallow nearshore habitat and habitat diversity important to salmon resources". "We hypothesize that shellfish aquaculture reduces productivity, abundance, spatial structure, and diversity of salmon populations." qualities of natural shorelines of the state shall be preserved to the greatest extent feasible consistent with the overall best interest of the state and the people generally." Signs illegally posted on private and county property. will dramatically and negatively alter Dutcher Cove. Washington State's DNR website states: "State commercial wild stock geoduck harvest takes place in a clearly defined area between 18 feet (corrected to Mean Lower Low water) and 70 feet in depth (corrected to Mean Lower Low water). The inner harvest boundary protects sensitive nearshore habitats like eelgrass beds." Therefore, by leasing the nearshore to geoduck farmers, DNR is violating it's own rule by not protecting nearshore habitat. DNR's 'best available science' does not include adequate study of intertidal aquaculture and it's interaction with forage fish and salmon habitat. Mussel rafts in Totten Inlet. certainty shall not be used as a reason for postponing cost-effective measures to prevent environmental degradation." "…in the face of uncertainty, the best course of action is to assume that a potential problem is real and should be addressed ('better safe than sorry')." Precautionary Principle, Section 15, Rio Declaration, United Nations. "Shellfish farming is assumed by many to be an environmentally benign industry. However, some practices will result in negative impacts as farming intensifies and expands." "Unfortunately, many of the basic scientific studies that are required to understand the impacts of shellfish farming have not been completed, and few studies of long-term impacts are being undertaken." Sustainable Shellfish, Recommendations for responsible aquaculture, page 11-12. "This method of culturing oysters appears to cause far more environmental damage than the current trestle based method. We must resist an introduction of such a method to Ireland, particularly the practice of spraying carbaryl in the intertidal zone." Ecological Implications of Mariculture in Ireland, page 80, on methods used in Willapa Bay, Washington State. The British Columbia, Canada, Ministry of Agriculture and Lands states on it's website: Note: "Applications for new intertidal geoduck aquaculture are currently NOT being accepted while the policy for intertidal geoduck culture is under review." If expansion of intertidal geoduck farming is banned due to lack of knowledge in British Columbia, then it should also be banned in Washington State. Shellfish Industry Propaganda: "geoduck clean the water". Geoducks consume phytoplankton, but they also produce feces and pseudofeces. Furthermore, geoduck comprise the largest single species biomass in Puget Sound. According to an article in the Seattle Times, 'The Geoduck Chronicles', the Washington State Department of Natural Resources estimates there are between 300 and 400 million individual geoducks, nearly 1 billion pounds total in Washington State! Jonathan Davis, a shellfish biologist for Taylor Shellfish Farms has stated, at the 2007 Sea Grant symposium, that there are areas of Puget Sound that have not even been surveyed for geoduck that may contain huge amounts of geoduck biomass, thus, the intertidal amount that the shellfish industry is referring to is inconsequential in terms of “cleaning the water” and is therefore essentially irrelevant. The shellfish industry statement: “geoducks clean the water” is nothing more than public relations fraud. If the shellfish industry was actually interested in clean water, they wouldn't spray Carbaryl, a chemical pesticide, on the tidelands of Willapa Bay to kill native burrowing shrimp. This immoral practice has been going on for decades to enhance commercial shellfish production. More shellfish industry propaganda: farmed shellfish mitigate against nitrification from septic systems and other human induced activities. This false assertion is best illustrated by this article written by Jim Gibbons of Seattle Shellfish. Gibbons' assertions are false and unfounded. In fact, marine circulation accounts for 98% of the N in Hood Canal. Septics account for less than 0.5%. Farmed bivalves also ingest fish and invertebrate eggs and larvae from the intertidal water column. Researchers from the U.S. Geological Survey found that large quantities of farmed bivalves in the Drakes Estero deplete nutrients and larvae from nearby ocean areas. "Such plastic poses one of the grave threats to the health of Puget Sound. The particulate plastic from such PVC tubes enters the food web and does untold harm to all the creatures in Puget Sound, including us. It is not healthy to eat geoducks raised in such a fashion." The CSAS (Canadian Science Advisory), in a review of the effects of shellfish aquaculture on fish habitat, in 2006 on pages 33-34 (25-26) states: “Field studies reported in the same study found that mussels consumed (based on stomach content analysis) copepods (<1.5 mm), crab zoeas (2mm), fish eggs (1-2mm), and even amphipods (5-6mm). Subsequent to this, Lehane and Davenport (Lehane and Davenport 2002) showed that mussels consumed organisms up to 3mm in length and that cockles (Cerastoderma edule) and scallops (Aequipecten opercularis) are also capable of consuming considerable quantities of zooplankton, both when suspended in the water column and when on the bottom. The size classes of organisms consumed in these studies suggest that the larvae of most commercial species may be at risk from this type of predation.” The logical inference is that intertidal geoduck could consume the larvae of forage fish (surf smelt and sand lance) which are critical food for salmon. The geoduck could also compete with forage fish for phytoplankton. Influence of Intertidal Aquaculture on Benthic Communities in Pacific Northwest Estuaries: Scales of Disturbance, Simenstad/Fresh 1995, page 23 (65). "Management strategies that fail to consider the tolerance of estuaries to anthropogenic disturbance, such as that posed by intensive aquaculture, may well threaten the sustainability of estuarine resources and ecosystem processes upon which coastal economies depend. Estuaries have a critical role in the life histories of many economically and ecologically important animals. Salmon, herring, smelt, crab and flatfish feed in Pacific Northwest estuaries…and several species of migratory waterfowl and shorebirds feed on the large invertebrate production that occurs on the mudflats…". "Growth and survival of animals in estuaries not only depends on specific habitats but on linkages between habitats and areas with the estuary." "The herring were caught and died under the netting whether the nets were properly secured or not." "Not all the fish were under the netting - some were caught on top". "The herring did spawn on the netting". Herring spawn visible on anti-predator netting. "Effects on fish habitat can extend beyond site-specific footprints and lease monitoring does not allow broad-scale, ecosystem-level effects to be understood or measured. Measurements of variables in far-field benthic and pelagic habitats are needed because deductions from existing ecological knowledge indicate possibilities for altered system states." Page 7: "The literature on the effects of bivalve aquaculture on sensitive habitats is currently fragmented and not conclusive." Page 8: "Shellfish aquaculture often occurs in sheltered bays and estuaries because they offer suitable substrate. Such areas are often highly productive environments and key habitats for many migratory species. Work is required to study how potential impacts of bivalve culture (human activity, presence of structures on the seabed and in the water etc.) influence species in these ecosystems." "Given the almost complete lack of knowledge on the types of habitat that may be negatively affected by shellfish aquaculture, more research on sensitive habitat is needed." Page 9: "Work is needed to identify thresholds values that represent significant changes in fish habitat as indicators of shellfish aquaculture effects on pelagic communities." In Technical Report 2007-03, Marine Forage Fishes in Puget Sound by Dan Penttila of the WS Dept. of Fish and Wildlife: "These agencies (WA Dept. of Agriculture, WA Dept. of Natural Resources) together with WA Dept. of Fish & Wildlife should seek a coordinated approach to the management of the growing aquaculture industry, with an eye toward modification of habitat-damaging culture practices and the mitigation of existing habitat degradation for which the industry has been responsible." "The bulk of the Puget Sound Basin’s shoreline is now in private ownership. The likelihood of continued financial and political pressure for shoreline modification by a landownership population largely ignorant of nearshore resource values and conservation risks is high." "In some instances, mollusk farming has harmed the marine environment by depriving wild filter feeders of food (FAO, 1991) and generating anoxic sediments through feces deposition (Grant et al., 1995; Kaspar et al., 1985). "Aquaculture is commonly presented as a clean industry. Nevertheless, intensive (densely stocked) aquaculture systems can produce large quantities of polluting wastes, as with other forms of intensive animal production." contributed to the decline of native West Coast oyster stocks." under legal permits. Some experts speculate that many more birds were killed illegally." "Aquaculture facilities constructed or operated without environmental protection in mind can cause serious environmental degradation..."
Environmental Defense Fund, 1997, Murky Waters, Environmental Effects of Aquaculture in the U.S.
"Anti predator netting should not be permitted unless ongoing studies show little to no negative impacts." "This practice of proceeding until there is proof of damage is in direct opposition to the 'precautionary approach' required under The Oceans Act." "Studies on the impacts of phytoplankton depletion on marine ecosystems must be undertaken before this industry is allowed to expand." "The 'precautionary principle' must be applied to alien species...the risks are unacceptably high." "Expansion should not proceed until all studies, including cumulative effect studies, have been completed." "Therefore, it is the complex of habitats, composed of varying substrate types, vegetation types, tidal stages, and other physical, chemical, and biological factors that support salmon in the nearshore." "Protecting and restoring the natural processes that form and maintain habitats is the key to success. The natural processes that form and maintain habitat in the nearshore serve as the foundation of the structure and functions that support salmon. Disruption of sediment and prey inputs, changes in hydrology and other processes results in a chain reaction, ultimately leading to lost or dysfunctional habitat for salmon. Impediments to natural processes need to be prevented or removed to allow for conditions conducive to salmon production." "For juvenile Chinook salmon in the smallest size classes examined (less than 90mm), diets were made up mostly of benthic/epibenthic prey." "The types of habitat responsible for prey production, the life history requirement of prey, and the seasonal and spatial patterns of prey abundance and distribution are important considerations in salmon conservation." "The intertidal regions that had been used for (shellfish) farming for 3 and 5 years had lower species richness...as compared to the intertidal region where no active farming occurred." "...studies are needed to determine the scale to which intensive use of the foreshore for shellfish purposes alone is feasible without undue harm to the environment." "When large numbers of filter feeders are introduced into a limited source environment, the effect on the already existing population could be drastic." "The development of shellfish farming activities causes great changes in ecosystems functioning." "Shellfish aquaculture could have a large impact on small cetaceans." "Hatchery raised smolts of Chinook salmon were released into a large intertidal pen containing eelgrass, oyster clusters, unstructured sediment, and Spartina cordgrass. They were implanted with acoustic tags that allowed their movements to be tracked in 2 dimensions at sub meter accuracy. After effects of tidal elevation and enclosure were accounted for, smolts responded only to native eelgrass..."
"It is an impossibly high standard to expect that bivalve aquaculture will not have any discernable effects on the ecosystem." "Effects on the ecosystem is a subjective assessment, and what level of change is permissible needs to be defined by discussion and consensus among all stakeholders." "Juvenile salmonids have the greatest potential to be impacted by geoduck culture." "Many pink and chum salmon populations spawn very close to the ocean or even in the intertidal zone." "In intertidal habitats, diet overlap for ocean type Chinook salmon was greatest with Starry flounder." "Several studies have pointed out the especially large contribution of harpacticoid copepods in the diets of juvenile salmon in estuaries." "...the survival of ocean type Chinook released from hatcheries was positively correlated with the percentage of the estuary in natural condition." "The salmon's dilemma goes back to the arrival of the first Euro-Americans in the Northwest. Unfortunately for the salmon, the settlers also brought their worldview and their industrial economy. They saw a fearful wilderness that had to be tamed, simplified and controlled. They saw the vast resources they needed to feed their voracious industrial economy. Their vision naturally directed them to reconstruct the Northwest to make it more like the places they came from than the place it was." "...it has been shown very clearly that the salmon restoration efforts to date, even though they have been well funded, have failed. They have failed because they are largely derived from the same worldview and assumptions that created the problem in the first place." "This dominant worldview defines ecosystems as warehouses for the storage and production of commodities, insists that humans stand apart from those ecosystems, and demands that they control, manipulate, and "improve" them." "The earth itself was seen as a giant factory "furnished by the great engineer." People had the mission of subduing the wild elements, of ridding the land of animals and plants that were useless to humans, and of bringing the whole system under efficient control. The fundamental goals of dominating, controlling, and manipulating nature for human use were deeply embedded in western culture." "If we are to have any hope of restoring the salmon to sustainable levels of abundance, we will have to begin by paying more attention to the salmon's world - not as it exists today, but as it existed before we simplified, controlled, and "improved" it. And in our restoration efforts, we must address entire watersheds - the whole chain of salmon habitat, from headwaters to estuaries - and then beyond, to the ocean." "…loss of open estuarine foraging habitat to aquaculture is likely to have a negative impact on shorebird populations." "Large scale bivalve farms filter phytoplankton and zooplankton out of the sea, substantially altering local food webs." Aquaculture, the ecological issues, Davenport et al. "A recent review of the ecosystem-level effects of shellfish aquaculture determined that while more study was needed, the available literature indicates that intensive shellfish aquaculture may divert materials to benthic food webs, alter coastal nutrient dynamics, and have cascading effects on estuarine and coastal food webs. In particular, the effects of geoduck aquaculture on the benthic environment and fauna, the food webs, water quality, and aesthetics are a current concern but very few studies have been conducted to examine them." "In addition, many species grown for aquaculture in Puget Sound are invasive species, such as Manila clams, Mediterranean mussels, Pacific oysters and Atlantic salmon". "Intertidal invertebrate communities can suffer from the effects of clam harvesting and trampling." "Work in this session clearly reveals that salmon use the Puget Sound basin widely, and migrate back and forth within it, heavily." "The early life history stages (of salmon) are the most important in determining ultimate survival." "Overall, our research indicates that shoreline modifications have the greatest effect on nearshore fish assemblages when the alterations extend from the supratidal through the subtidal zone." "Legislative findings set out in RCW 90.58.020, that the shorelines of our State are the most valuable and fragile of its natural resources and that it is of great concern to all throughout our State relating to its utilization, protection, restoration and preservation." *The hearing examiner's decision, based on expert testimony, states that geoduck farms are indeed a 'structure', that they 'obstruct public use' of the water, and that they cause 'habitat disruption'. "The path society is on, according to fisheries experts, is that Chinook stocks will be driven to extinction before the end of this century." "California is being much more proactive in their salmon recovery and setting aside marine reserves (no-fishing zones) and looking forward to recovering salmon, whereas up here (Washington State) fishing interests and commercial interests get first dibs." "But almost always the essence of the lives--the finding of food, the hiding from enemies, the capturing of prey, the producing of young, all that makes up the living and dying and perpetuating of the sand--beach fauna is concealed from the eyes of those who merely glance at the surface of the sands and declare them barren." "Science does not ask: do we want to have geoduck aquaculture in the intertidal area -- that is a policy question. What we can do with science is ask what are the impacts of geoduck farming on species diversity or how does the turbidity associated with substrate liquifaction impact the health of fish in the region." "There are 28 million jobs in the fishing, tourism and recreational boating industries -- all of which depend on healthy estuaries for their products and customers. Indeed, estuaries and coastal waters provide essential habitat for 75% of America's commercial fish catch and 80 to 90% of the recreational fish catch." "180 million Americans -- approximately 70% of the entire population -- visited estuaries in 1993 for vacations, recreation, sport, or sightseeing. They enjoyed swimming, fishing, boating, diving, wildlife viewing, hunting, hiking, and learning." "Help our children learn. Estuaries are a matchless educational resource that must be maintained as living laboratories of life." "For the most part, the loss in each estuary is an accumulation of small development and other projects. The destruction of estuary habitat is surprising in its extent and severity, amounting to tens of millions of acres destroyed. Estuaries will suffer 'death from a thousand cuts' if this loss of habitat is not stopped and reversed now." " While I believe that people should be able to do what they want with their property, the trouble with it (geoduck farming) is it’s a commercial operation in a residential environment." "It becomes very disruptive." "It (geoduck farming) is dangerous, destructive and obtrusive to the people who want to exercise freedoms on the water to try and allow this type of commercial activity to occur when you most likely would be using that water frontage..."
" If future generations are to remember us with gratitude rather than contempt, we must leave them more than the miracles of technology. We must leave them a glimpse of the world as it was in the beginning, not just after we got through with it." "We are in danger of destroying ourselves due to greed and stupidity." "A thing is right when it tends to preserve the integrity, stability and beauty of the biotic community. It is wrong when it tends otherwise." "Examine each question in terms of what is ethically and aesthetically right, as well as what is economically expedient." "Harmony with land is like harmony with a friend; you cannot cherish his right hand and chop off his left." "The great enemy of the truth is very often not the lie - deliberate, contrived, and dishonest - but the myth - persistent, persuasive, and realistic." It makes economic sense to restore wild salmon runs in Puget Sound. Currently, chinook salmon runs are less then ten percent from what they were 100 years ago! CISA supports efforts to restore salmon runs in Case Inlet and all of Puget Sound to historic levels of sustainable harvest. 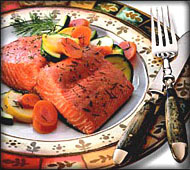 Compare nutritional values of salmon and geoduck. Note: Serving size: 3oz. (85 grams) Before Cooked, Edible Portion. Nutritional value for salmon will vary 1-2% in protein and fat content from these average values, depending upon the maturity of the fish. Source: Sidwell, Virginia D., Chemical and Nutritional Composition of Finfishes, Whales, Crustaceans, Mollusks, and their Products; NOAA Technical Memorandum, 1981. Salmon has three times the calories of geoduck per gram, twice the protein, and five times the omega 3 fats at one third the price! This slide show demonstrates the value of wild salmon over farmed. Because of population and economic growth in Asia, the demand for geoduck has grown exponentially. In just over twenty years the price has increased by a hundred fold. A plate of geoduck in Hong Kong or Tokyo sells for around one hundred dollars. In the 1970's geoduck sold for about twenty cents per pound. Because of the geoduck's profound phallic appearance it is considered to be an aphrodisiac in Asia. Far from being a staple item, geoduck is a Super Luxury Food primarily served to Asia's upper classes and bourgeois rich. Live geoduck for sale in Hong Kong. According to the Washington State Department of Ecology geoduck do not naturally occur in any quantitative abundance of the intertidal nearshore zones where they are currently being farmed. Geoduck habitat ranges from the sub tidal zones to the lower inter tidal zone. Jonathan Davis, shellfish biologist from Taylor Shellfish Farms, also stated at the recent Sea Grant Symposium that the main habitat of geoduck in Puget Sound is subtidal, at a density of about 2.1 geoduck per square meter. Thus, the intensive intertidal nearshore geoduck farming can displace or harm the natural benthic life and forage fish habitat of the intertidal nearshore zone, which is critical habitat for salmon. New intensive methods of aquaculture are converting natural beaches into single use agricultural zones. To the average person, it is common sense that this is a disturbance to both people and wildlife. In fact, shellfish aquaculture is well known as a human induced stressor to salmon habitat. In addition to aquaculture itself, boat traffic, wetland modification and invasive species are also known stressors to critical salmon habitat that can be attributable to shellfish farming.